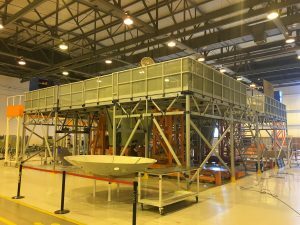 MAKRO AERO is a manufacturing and engineering company that provides Access Stands, Platforms, Maintenance Docking & Painting Docking Systems to civil – military, business aviation and MRO companies. We offer best solutions and innovative products to our customers to meet their engineering and operational challenges in their daily operations. We retain in-house design capability and offer both standard and custom-made products to our customers. We aim to increase effectiveness, efficiency and safety when designing our products. 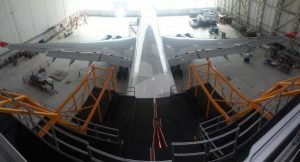 Our products serve both wide body and narrow body aircrafts. 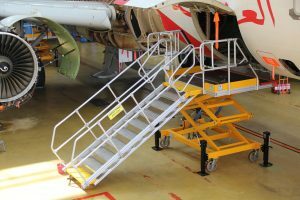 MAKRO AERO products range from simple standard access steps to complex and large customized docking structures. 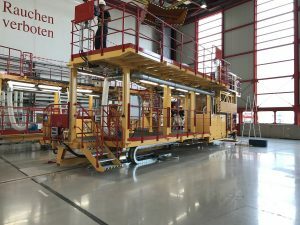 We designed, developed and manufactured more than 80 different types of stand which are currently used by AIRBUS and BOEING aircrafts as well as SIKORSKY and AIRBUS helicopters. Our product portfolio provides effective and efficient access solutions to all areas of aircrafts and helicopters that need to be reached by the technicians. We offer multiple solutions to be chosen by the customer at his discretion. We also manufacture various types of ground support equipment for civil aviation and military. As MAKRO AERO we take safety first and foremost. Therefore, we make sure that our products are built with the highest quality and standards. The raw material and the supplies we use are of high grade and meet our and our customers` quality standards. We always make sure our products comply with standards stipulated by both the industry and the customer. MAKRO AERO is a ISO 9001:2015 certified company. Our products function effectively and are easy to use, safe and durable. We make sure technicians feel safe and comfortable while working on our access stands and platforms. Due to significantly reduced weight our products are easy to maneuver. We strongly believe in the power of communication. We do not simply offer a standard product to a customer. We first communicate to understand the customer’s needs and make sure s/he receives the best solution. That’s why we allocate significant portion of our time to interact with the customer. We always welcome customer involvement and participation in the process. We both operate nationally and internationally. We are strategically located in a place where Europe, Asia, the Middle East and Africa meet. Our manufacturing facility in Istanbul is close to 2 airports and Istanbul seaport to ship our products virtually anywhere in the world. MAKRO AERO also focuses on MRO tool design and manufacture. We provide solutions to MROs’ tooling needs. We have accumulated experience in MRO tool design and manufacture throughout the years. As a logistics service provider, we offer Independent Third Party and Project & Contract Management Services to our customers operating in the logistics and defense industries. We stand by the customer during the employment of our products and systems. 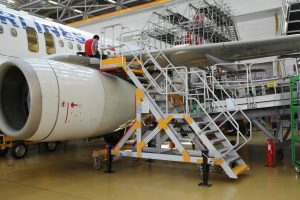 Be it Access Stands, Platforms, Maintenance Docking & Painting Docking Systems, MRO Tool Design & Manufacture, GSE or Logistics Services we observe that www.makroaero.com solutions bring value to our customers’ business operations. 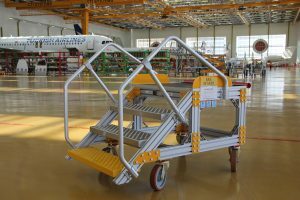 MAKRO AERO is a high-quality manufacturer of aircraft and helicopter access stands and platforms. We offer a wide range of access stands from simple standard access steps to complex and large customized platforms. 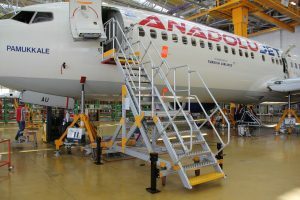 We designed, developed and manufactured more than 80 different types of access stand which are currently used by narrow body and wide body AIRBUS and BOEING aircrafts as well as SIKORSKY and AIRBUS helicopters. We are constantly broadening our product range focusing on the dynamic needs of the industry. Turkmenistan Airlines use our products in their operations. 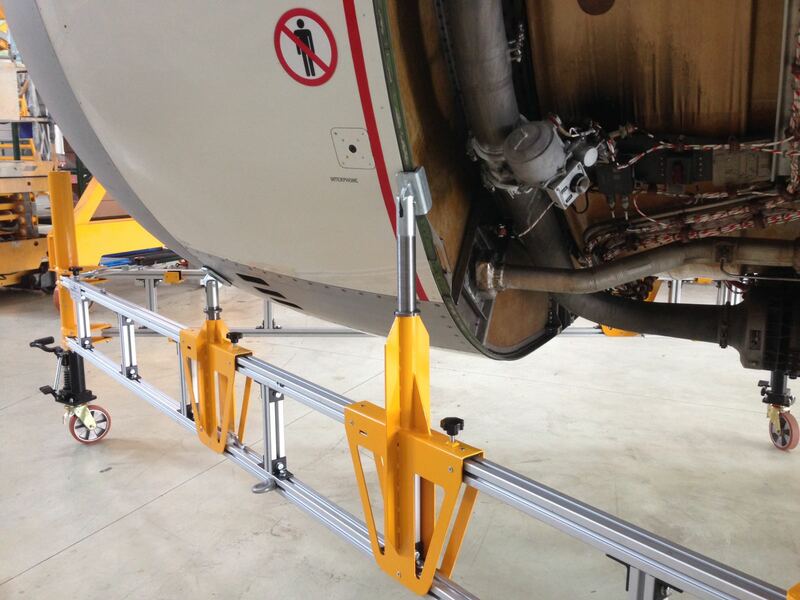 MAKRO AERO access stands and platforms offer smooth access to engine cowls, MLG, NLG, CLG, E&E areas. The technician can solely operate the stand and does not need outside push-pull help to position the access stand/platform to the desired area. Reduced weight structure helps the technician maneuver the stand easily on his own. 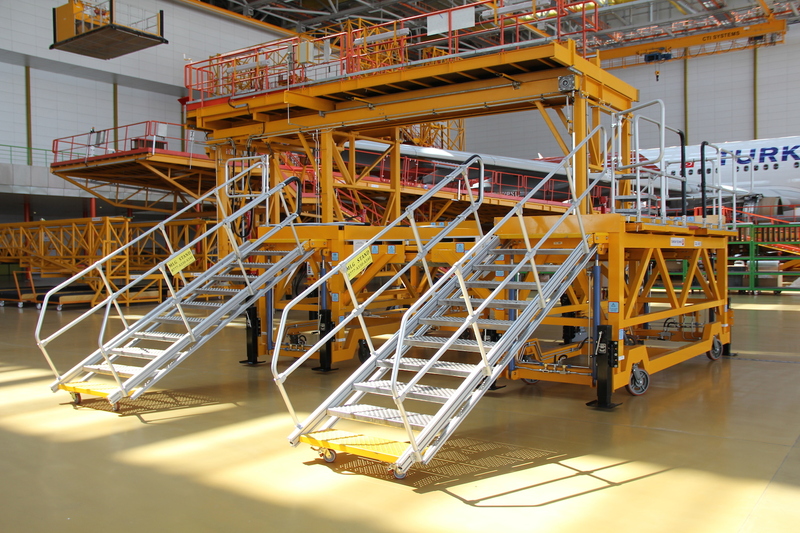 When we design our access stands we give priority to the area stands occupy in the hangar or apron. Hangars and aprons have limited space. Our access stands do not use up unnecessarily large space in their operation areas. Also, they are easily towable which increases their operational area coverage. 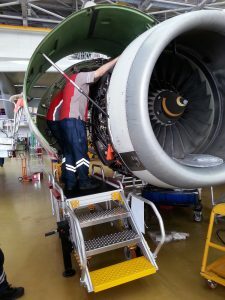 MAKRO AERO Multi Purpose Stands (MPS) enable technicians carry out their work performance on the fuselage, tail, nose, wings, PAX door, pylon with one easily maneuverable stand. We can enlarge the platform area to accomodate the required number of technicians. Multi Purpose Stands (MPS) come with fixed height or adjustable height depending on the customer desire. MAKRO AERO access stands are enhanced with balance strengthening systems to avoid tipping when weight is applied on the edges or corners during work. This provides comfort and confidence to the technicians when working. They need not worry about their safety. We make sure our products stay operational in every environment; whether it’s indoors or outdoors or it’s dry or rainy even snowy. They are durable and come with anti-corrosion features which enable a long life span. We make sure they serve our customers intact for years to come. They are also easy to maintain. We supply spare parts as needed. We pledge to stand by the customer throughout the service life of our products. We own the design specification of our access stands and platforms and constantly improve them to excel in efficiency and safety. We follow the aviation industry closely and newly introduced Quality and Safety Standards are incorporated into our products immediately. MAKRO AERO embraces the customer’s objectives as its core reference and starting point. We proudly proclaim that we first listen. We do not simply offer a standard product to a customer. We first communicate to understand the customer’s needs and make sure the customer receives the best solution. That’s why we allocate significant portion of our time to interact with the customer. We always welcome customer involvement and participation in the process. Our maintenance docking system has been employed on the field and is currently operational on wide and narrow body aircrafts. 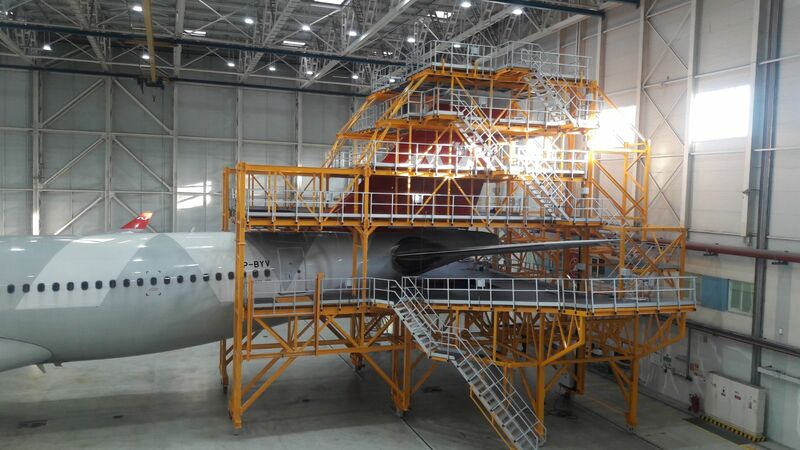 Aircraft Maintenance or Aircraft Painting is a complicated and a costly process. 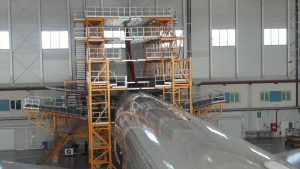 Apart from the maintenance and the painting processes grounding the aircraft costs the operator. Our docking systems are easy to assemble and install which in return require significantly less set up time for the maintenance or the painting process. This inarguably translates into less ground time for an aircraft. We also offer assembly and installation service to our customers should they feel the need. We offer the complete docking system that surrounds the aircraft as well as area focused docking systems; the nose, the tail and the wings. MAKRO AERO maintenance docking and painting docking systems come with hard rubber edges to avoid any damage on the aircraft. 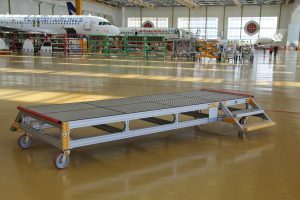 Platform areas are slip-resistant for fall protection and area size can be customized depending on the customer requests to enable technicians to operate safely, effectively and efficiently during maintenance or painting processes. Our platforms provide good and comfortable movement area to the technicians working on them. MAKRO AERO maintenance docking and painting docking systems come with the requested electrical equipment and lighting by the customer. 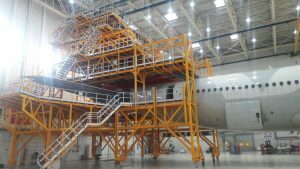 Our Aircraft Maintenance Docking and Painting Docking Systems are designed and manufactured in accordance with the Quality Standards and meet international Safety Standards. We offer custom solutions responding to your particular needs in your operational environment. Our solution is a combination of excellent design features, Safety and Quality Standards and the requirements articulated by the customer. 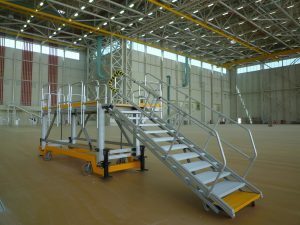 The customer is the indispensable feature of designing Aircraft Access Stands/ Platforms and Maintenance Docking/ Painting Docking Systems. MAKRO AERO also focuses on MRO tool design and manufacture for civil aviation and military. We provide solutions to MROs’ tooling needs. We have accumulated experience in MRO tool design and manufacture throughout the years. In MRO tool design and manufacture our objective is to increase the effectiveness and efficiency of our customer operations. 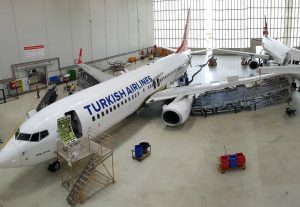 We offer best solutions and innovative MRO tooling products to our customers to meet their engineering and operational challenges in their daily working environment. We follow the industry closely and ensure that the customers’ needs are reflected in the design process along with the Quality and Safety Requirements. MAKRO AERO products come with a nice price tag. Contact us to see what solutions we have to offer. We are a phone call or an email away. 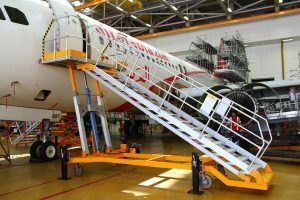 MAKRO AERO furthermore designs and manufactures Ground Support Equipment and Intralogistics Equipment such as Tire & Brake Carts, Belt Loaders, Dollies, Telescopic Belt Conveyors, Towable Passenger Stairs, Engine Transportation Equipment and Towbars. Our intralogistics equipment is engineered to boost the throughput and thus grow operational productivity. 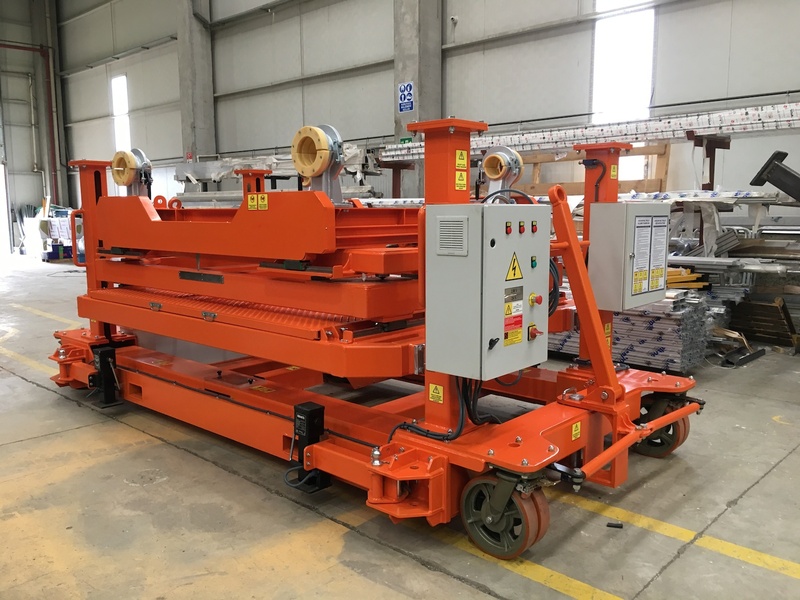 We offer standard custom-design material handling equipment as well as customized products according to customer specifications.